Our 4th annual Charity Auction will be held at The Waterfront in Wyandotte on Friday, May 3, 2019 from 6-10pm. Doors open at 5:30pm for registration, early preview of auction items and to obtain a bid number. We will have many unique auction items that may include Professional Services, Sports Tickets, Sports Memorabilia, Theme Park Tickets, Jewelry & Artwork, Gift Baskets, Gift Certificates, Rounds of Golf and more. 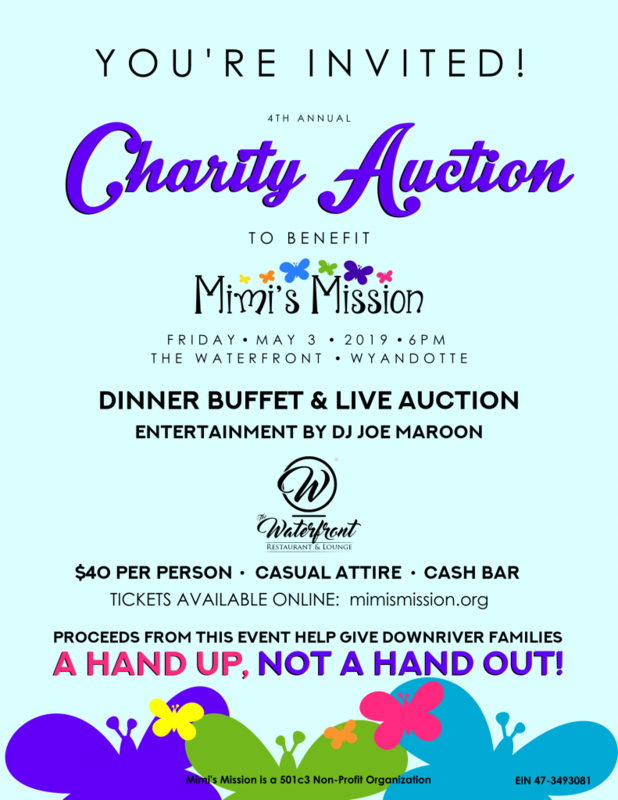 Please join us for a wonderful evening of delicious food and fun all to benefit Mimi’s Mission! This is a casual event with a cash bar. Please note, your purchase confirmation email is your digital ticket to the event.